If you’ve ever been invited to an elegant dinner where every bite is a delight and each new course makes you hungry all over again, then you want to treat yourself to what amounts to a sumptuous feast for your eyes – an exhibition of Chuck Close prints at the Orange County Museum of Art. 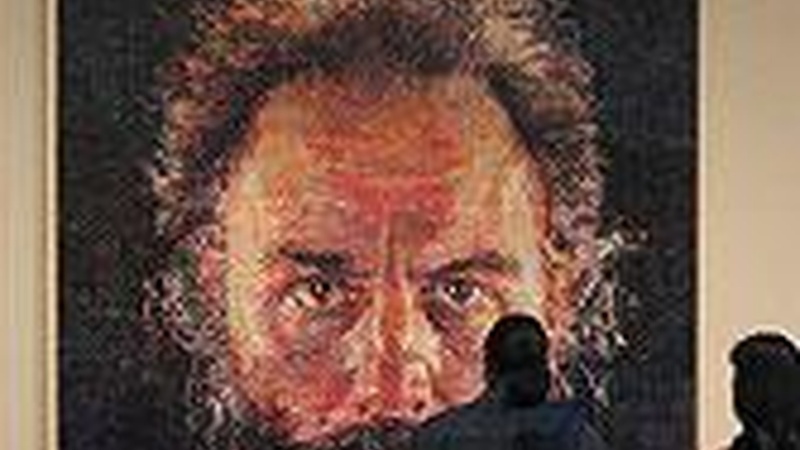 One of the most prolific and best-known American artists, Chuck Close created an unforgettable range of portraits done in a unique mosaic-like technique of thumbnail sized marks on paper or canvas. From a distance these marks fuse into an attention-grabbing close-up of faces staring at the viewer with unparalleled intensity. The artist, who never accepts commissions, only makes portraits of friends and family. He is known for focusing on the same person again and again, as in the case of composer Philip Glass, whose likeness Chuck Close captured in close to fifty portraits. This traveling exhibition presents more than 100 works and encompasses thirty years of the artist’s career, with an emphasis on printmaking, which he elevated to a high status it had not previously enjoyed in the United States. What’s unusual about this exhibition is that it knows how to inform and educate the viewer in the mysterious process of printmaking - but does it with a dash of theatricality. Most of the finished portraits are displayed along with various states of the same print, so one feels privileged to be invited into the artistic kitchen, so to speak, and to watch and taste a delicious meal being prepared step-by-step. I don’t remember another exhibition where the complicated and labor-intensive process of printmaking was illustrated so thoroughly and with such panache. On a few occasions, we see the devices used by the artist in his printmaking process - wood or metal plates - each adding yet another layer of visual information to the final image. Though not presented as individual artworks, some of these large-scale metal plates, with portraits etched into their surfaces, have so much presence and so much tactile sensuality that it is impossible not to admire them for their sheer physical attractiveness. Makes you think of the beautiful peasant girl of the fairy tale, whose charms the prince simply cannot resist. Having been seriously incapacitated by a medical condition that has long confined him to a wheelchair and even partially impaired the use of his hands, Chuck Close turned these limitations into creative gold. Not able to make sweeping gestures with his hands, he used on occasion his thumb as a printing tool by dipping it into ink and pressing it onto paper until thousands of these thumbprints coalesced into a vibrant portrait. I don’t know anyone among contemporary artists who surpasses Chuck Close in the skill and depth of his portraits. And he continues to challenge himself. The last few years he produced a series of limited edition tapestries, collaborating with Oakland-based Magnolia Editions. A few of them are included in this exhibition, and at the recent LA Art Show, I saw the unforgettable large tapestry based on his Daguerreotype self-portrait. From a distance it read as a black and white image, but upon closer inspection it revealed that it takes a whole rainbow of colors to add up to a convincing impression of a black-and-white photo image. Before going to see the show, check out on the KCRW website the text of this Art Talk for the link to Magnolia Editions with its wealth of additional information on the art of Chuck Close.